Sam Tordoff arrived at Croft Circuit leading the Drivers' Championship on 139 points, just one point ahead of Matt Neal in 2nd place. Not far behind are Tordoff's team-mate Rob Collard and Neal's team-mate Gordon Shedden on 113 and 112 points respectively. With Adam Morgan 5th on 108 and Andrew Jordan 6th on 102, the Dunlop MSA British Touring Car Championship is really tight at the top as we head towards the mid-season break after Sunday's three races. 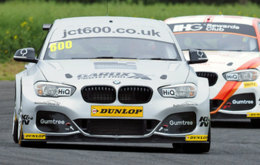 The first car on track for the first free practice session was the WSR-prepared Team JCT600 with GardX BMW 125i M Sport of Sam Tordoff which for this weekend is carrying a special 'platinum' livery to mark JCT600's 70th anniversary. The rest of the field also took to the track with many drivers pitting after one or two shake-down laps. After a few minutes, representative lap time started being posted as the drivers settled into the session. 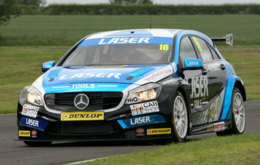 Aiden Moffat topped the time sheet in the first session with his Laser Tools Racing Mercedes Benz A-Class posting a lap time of 1:25.038 around the North Yorkshire circuit. 2nd fastest was Motorbase Performance's Andrew Jordan in his Ford Focus with Sam Tordoff 3rd. Tom Ingram was 4th fastest in his Speedworks Motorsport Toyota Avensis with Adam Morgan's WIX Racing Mercedes Benz A-Class 5th and Colin Turkington's Silverline Subaru BMR Racing Levorg GT completing the top 6. Overnight rain had left the track extremely slippery with many drivers reporting a substantial lack of grip however Aiden Moffat was delighted with the session, saying: "It was the first time that we had run this setup since a tyre test two years ago. I always thought it would be good to try it again as it makes the car so much more fun to drive. It seems to have worked and the car is now closer to where I want it." With the temperature slightly warmer and the track less 'green' than in the morning, the second practice session got under way, producing marginally faster lap times. 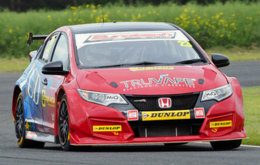 Following his good form last time out at Cheshire's Oulton Park circuit, Eurotech Racing's Daniel Lloyd topped the time sheet in his Honda Civic Type R with a lap time of 1:44.511 - 0.031 seconds faster than Colin Turkington's 2014 race lap record and an impressive result for the BTCC rookie from Yorkshire. Tom Ingram's Toyota Avensis went 2nd fastest for Speedworks Motorsport, just 0.009 seconds behind Lloyd, with Andrew Jordan once again in the top 3 and only 0.004 seconds behind Jordan. Sam Tordoff ended the session 4th fastest ahead of Silverline Subaru BMR Racing team-mates Warren Scott and Jason Plato who were 5th and 6th fastest respectively. The next BTCC action from Croft is the qualifying session to determine the grid for the first of tomorrow's three races.